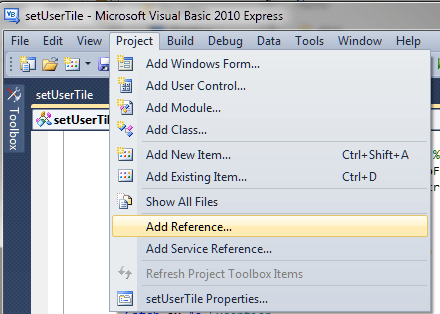 This code was written using the free Visual Basic 2010 Express. Once you have that installed, you can create a new Console Application named “setUserTile”. And add a reference to both “System.DirectoryServices” and “System.DirectoryServices.AccountManagement”. NOTE: You may also wish to change the version of .Net for this application to 3.5, which is the version that ships with Windows 7. 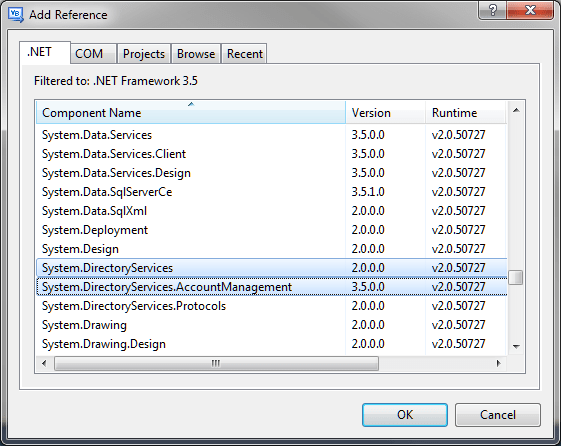 If you leave it at 4.0 (the default for VB.Net 2010) the application will only be able to run on systems that have installed v4.0 of the .Net framework.
' ... and delete the temporary file. setUserTile in VB.Net by Jacob Steenhagen is licensed under a Creative Commons Attribution-ShareAlike 3.0 Unported License. Based on a work at joco.name.